It has always been accepted that Kimberley Mine in Northern Cape, South Africa is the deepest and biggest mine dug by hand. And yet, it isn’t. Jagersfontein Mine claims that title, but this fact has not diminished the attraction of ‘The Big Hole’ since it is the site of the world’s biggest diamond rush. Before the discovery of diamonds in South Africa, the country's economy was largely dependent on trade and agriculture. Diamonds, and later gold, were found by chance. Three thousand kilograms (6,600 pounds) of diamonds were recovered from the Big Hole by 50,000 workers excavating 22 million tons of earth. Over the years, thousands died due to mining accidents, unhygienic living conditions, scarcity of water, and the lack of fresh food. Because of this, many say the Big Hole is cursed. In the 1860s, Erasmus Jacobs, aged 15, often collected stones on their farm near Hopetown (120km or 74 miles south of present-day Kimberley). In 1867, a neighbor, Schalk van Niekerk, asked if he could borrow one of the shiny stones which Jacobs had found the previous year. The diamond was shown at the Paris Exposition in 1867 and later cut to its present form and became known as The Eureka Diamond. Three years later, having learned something of precious stones, Schalk traded a shepherd boy for a stone, giving him 500 sheep, ten oxen, and a horse. A few days later he sold it for £11,200. The stone was later sold by a diamond cutter to William Ward, the Earl of Dudley, for £25,000. The Star of South Africa (also known as the Dudley Diamond) was owned by the Wards until 1974 when it was sold on auction in Geneva for the equivalent of around £225,300 at the time. The diamond was also part of the ‘Cartier In America’ exhibit in 2009. These two finds led to the first diamond rush in 1869. In 1870, children found diamonds on their father's farm Dortsfontein. A stampede of diggers followed, and the site became the second enormous hole in the ground. In May 1871 a new discovery was made on the farm Vooruitzicht (owned by the de Beer brothers who had been granted the title deeds to the farm in 1860). This was to become the third massive hole. Two months later, in July, a servant working for a party of diggers from Colesberg found three diamonds on a small hill known as Colesberg Kopje, just a few hundred meters from the earlier find on the farm Vooruitzicht. Colesberg Kopje quickly became a crater thanks to the new rush of miners and soon ‘New Rush’ engulfed the earlier camps. However, Secretary of State for the Colonies, Lord Kimberley (John Wodehouse, 1st Earl of Kimberley) considered the term ‘New Rush’ to be vulgar and could not pronounce the Dutch name, Vooruitzicht… neither could he spell it. The problem was solved by Colonial Secretary J.B. Currey and the fourth hole in the ground was called Kimberley Mine. The four great mines were roughly circular in shape and miners constructed their dwellings as close to the mines as possible. Traders and storekeepers put up their buildings in any vacant spot. The shacks, shanties, huts and shelters were constructed of any material that would protect them from the rain and the scorching sun. In March 1888, the leaders of the various mines amalgamated the separate diggings into one large mine under De Beers Consolidated Mines Limited, with life governors such as Cecil John Rhodes, Barney Barnato, and Alfred Beit. Cecil Rhodes arrived in South Africa in 1870, aged 17. Attracted to the diamond rush, he sold ice to miners working under the hot African sun and saved up, buying as many mining claims as he could. Initially, his biggest rival was Barney Barnato, but he went on to be the first chairman of De Beers. Barnet Isaacs, ‘Barney Barnato’ being a name he adopted when performing at the Music Halls in England, was born to humble beginnings . When he landed in South Africa, he could not even afford a coach to where the diamonds had been found. He ended up walking which took him three months. Alfred Beit, however, had a very different upbringing as he was the son of an affluent German citizen and had already made money before arriving in South Africa to take advantage of the diamond rush. The outbreak of war in 1914 saw the suspension of all mining at De Beers’ properties and the Kimberley mine never re-opened. When mining operations closed down, the massive hole became a tourist attraction. In the 1960s, the relics of Kimberley, including old buildings and various memorabilia, were collected in a museum. In 1965 the museum was upgraded to an open-air demonstration, and in 1971 it was officially opened during Kimberley’s centenary celebrations. 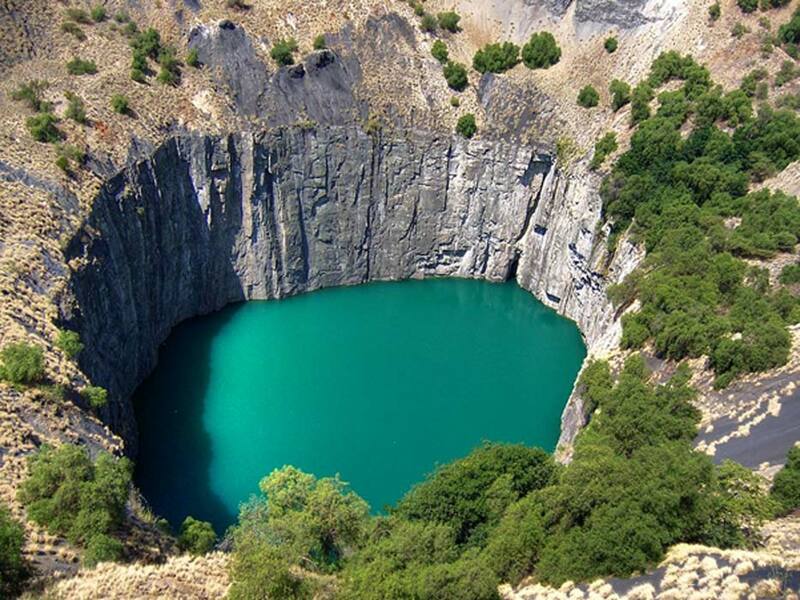 By 2005 De Beers had invested millions to develop the Big Hole into a tourism facility, creating "a lasting legacy for the people of Kimberley". The exhibition covers the formation of diamonds, the history of the diamond fields, as well as an exhibit of diamonds which includes replicas of the Hope diamond , the Dresden Green, and the Star of South Africa. Walk around the Old Town or take a guided tour and learn more of the story of Kimberley. It was the first city in the Southern Hemisphere and in Africa to have electric street lights which were first lit in September 1882. The buildings are period pieces filled with memorabilia and historically relevant artifacts. There’s a collection of shops, churches, a functioning pub and a guest house, although other accommodation is plentiful. Registering the Big Hole as a UNESCO World Heritage Site has been underway since the early 2000s.